Cantaloupe (Cucumis melo) save a lot of health benefits. Cantaloupe or muskmelon is rich of minerals, pro vitamin A, potassium and dietary fiber. Nutrient content in the fruit is beneficial for improving endurance, healthy kidney and spleen function, and lowers blood pressure. Cantaloupe fruit is tasty. Especially if made iced cocktail,ice, or make juice.In the summer, cantaloupe is the best option for relieving thirst. Not only that, if you experience canker sores cantaloupe fruit is the solution. cantaloupe fruit contains vitamin C and vitamin B6. For people with hypertension and diabetes cantaloupe very good to be consumed. Cantaloupe nutritional values is very varied. A bowl of cantaloupe contains, among others, 3.1 mg beta-carotene; 68 mg of vitamin C; 1.3 mg fiber; 13 mg carbohydrates, 494 mg potassium, and 14 mg sodium. In addition, the elements calcium, phosphorus, iron, niacin, protein, polyunsaturated fats can also be obtained from the cantaloupe. Meanwhile, according to The Journal of Food Science content in 100 grams of cantaloupe, on average contains 12.69 mg of magnesium; 0.03 mg manganese; 0.05 mg of copper; 0.10 mg zinc; 0,003 mg of cobalt, and 0.005 mg chrome. Considering levels of beta-carotene is quite high, cantaloupe is good to consume because it can counteract free radicals which is one cause of heart disease and cancer. In the manual of the RDA (Recommended Dietary Allowance), there is a suggestion that we consume beta-carotene approximately 5-6 mg per day to maintain your cardiovascular health. Referring to the suggestion, we would not need complicated steps to get your intake of beta-carotene. We simply consume cantaloupe regularly and maintained a healthy heart. The content of potassium in cantaloupe fruit can lower high blood pressure, reduce the formation of plaque in the arteries, as well as a natural laxative. Vitamin A contained in it can maintain healthy eyes and good bone and consumed for active and passive smokers. Potassium contained in cantaloupe able to control blood pressure, suitable for people with hypertension. 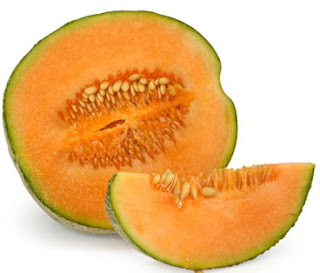 Cantaloupe also has a low glycemic index (GI), Fructose and glucose contained in cantaloupe fruit is a natural simple sugar so it is safe to eat for people with diabetes, obesity. It also can prevent uric acid. Cantaloupe is a good source of vitamin A and beta-carotene are very good. The content of beta-carotene is an antioxidant that may play an important role in reducing the concentration of peroxyl radicals or free radicals which can prevent premature aging or prevent cancer. Cantaloupe can also maintain a healthy heart, lungs, or blood vessels. Can increase endurance, healthy kidney and spleen function, and lowers blood pressure because of its rich mineral content of provitamin A and potassium and dietary fiber. The high folate content in the fruit helps in the production and maintenance of new cells, especially in pregnant women.